A very warm welcome to the Winter 2015 edition of the ECTRIMS newsletter. First off, on behalf of the ECTRIMS Council and Executive Committee, a word of gratitude is due to all those many of you who came to Barcelona for our 31st annual conference. We surpassed the astounding figure of 9,000 participants, the highest ever. We have had much positive feedback formal and informal pointing to a high degree of satisfaction. A number of elements factored into the success of the meeting; most importantly those breakthroughs that were communicated in Barcelona opening the way for the treatment of PPMS. The venue and the weather also helped. So, thank you all one more time. On to the next venue. We hope to see you all again in London on 14-17 September 2016. ECTRIMS has awarded honorary membership to two key leaders whose work for Multiple Sclerosis has contributed to advancement within the ECTRIMS goals and values. We also welcome new Council members who will ensure that ECTRIMS stays fresh and in touch with all its country members. Please be sure to have a good look at the learning opportunities ECTRIMS offers through upcoming events in March, May and June. In this regard a call has opened to receive applications to attend the next Summer School. The fellowships and grants programs are in full swing. These are programmes that we are particularly proud of. 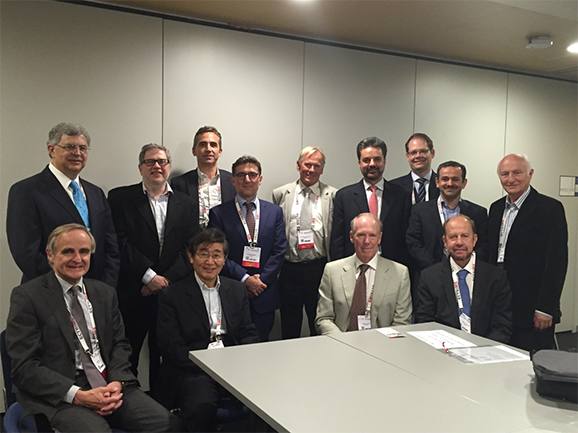 Read about the first joint ECTRIMS/MSIF alumni meeting held in Barcelona as a proof of their success. Please make sure that those around you know about these programs and do encourage them to apply. Last, but not least, also please read about the increased support of joint work and activities of ECTRIMS with other Societies. 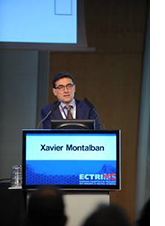 The 31st ECTRIMS Meeting took place from October 7-10, 2015 in Barcelona and was a tremendous success. After several years in a row it showed again an increase in participants and submitted abstracts. With over 9000 participants it was the largest ECTRIMS meeting ever. It covered a broad spectrum of topics, ranging from the first public presentation of large clinical trials to basic research. Among the most recognized topics were “Update on therapies”, “Risk Management”, “Personalized Therapy”, “Clinical Phenotypes”, and “Will MS be prevented?”. In addition to the scientific programme there was an extensive teaching course programme that covered different aspects of clinical practice as well as basic mechanisms of neuroimmunology and myelin biology. Sessions organized by the International Multiple Sclerosis Cognition Society completed the programme. The city of Barcelona and the congress venue were ideally suited to host this large meetin g and provided the background for an enjoyable social programme. We are grateful to Prof. Xavier Montalban, chair the local organizing committee, Prof. Per Soelberg Sorensen, chair of the teaching courses committee, Prof. David Miller, chair of the scientific programme committee, and all their co-workers for their enduring effort in organizing this successful and outstanding meeting. Thank you for joining us at the 31st ECTRIMS congress in Barcelona 2015! As recognition of their long-lasting research efforts in MS and their continuing support of ECTRIMS we are pleased to welcome two new ECTRIMS Honorary Members. A list of all ECTRIMS Council members is available here. The next ECTRIMS Focused Workshop on the topic of „Environmental, modifiable risk factors for multiple sclerosis: What have we learned, where are we headed?” will be held on 3/4 March 2016 in Florence/Italy. The scientific organizers are Prof. Maria Pia Amato, Florence/Italy (workshop chair), Prof. Xavier Montalban (ECTRIMS President), Barcelona/Spain and Prof. David Miller (ECTRIMS Vice-President), London/UK. Mainly epidemiological, but also experimental research over the last two decades underscore the potential role of environmental and lifestyle, modifiable risk factors implicated in the initiation of the disease and sometimes in its course and prognosis. Improving our understanding of environmental factors involved in MS and their interplay with genetic factors will lead to new and more effective approaches to patient counseling, and, possibly, prevention and management of the disease. This focused workshop gathers experts in the field from around the world to discuss available evidence on the most prominent factors, like infections, vaccines, vitamin D, smoking, body weight, diet, alcohol, stress, co-morbidities and the role of gut microbiome. The aim of the workshop is to highlight new avenues of research, to better understand the role and connections between these risk factors and MS, and to explore possibilities how to modify MS risk and course by influencing these environmental, modifiable factors. Further information about the workshop will be available on the ECTRIMS website at https://www.ectrims.eu/ectrims-focused-workshops/ soon. The next ECTRIMS Summer School on the topic of ”Use of MR imaging in diagnosis and management of multiple sclerosis” will be held from 28-30 June 2016 in Vienna/Austria. This ECTRIMS Summer School is directed to young clinicians and investigators with an interest in the diagnosis and management of MS. The immediate objective is to equip them with knowledge and expertise they need to (i) accurately diagnose MS, (ii) evaluate the effectiveness of disease modifying treatments in MS, (iii) understand the value of non-conventional and quantitative MR for assessing the structural, metabolic and functional damage, and (iv) become familiar with the different techniques used for imaging analysis. The faculty will include internationally renowned experts, who will be selected based on their scientific expertise and educational skills to ensure high-quality teaching and interactive case discussions. This Summer School is being jointly coordinated by MAGNIMS and ECTRIMS (Organisers: Alex Rovira, Nicola de Stefano, Xavier Montalban, David Miller). The programme will include lectures (e.g., on MRI diagnosis), specialised workshops (e.g., on advanced MR techniques), interactive discussions, and group work with presentations undertaken by attendees. Further information will be available on the ECTRIMS website at https://www.ectrims.eu/ectrims-summer-schools/. ECTRIMS is covering the registration fee, accommodation as well as a travel grant for the accepted applicants. This new ECTRIMS activity will be launched in 2016. The first Regional Teaching Course in2016 will take place 19th-21st of May in St. Petersburg/Russia. The aim is to establish local teaching courses in border areas of Europe and other (neighbouring) parts of the world and to provide ready access for large groups of neurologist to high quality training in MS clinical care. The teaching courses are organised by the ECTRIMS Teaching Course Committee. There will be a close collaboration with local MS experts and neurological associations as well as other TRIMS organizations to ensure the optimal coverage of locally relevant topics. The 32nd ECTRIMS congress will take place from Wednesday 14 September to Saturday 17 September 2016 in London, United Kingdom (ExCeL Centre, a modern state-of- the-art facility in east London and close by the London City Airport, www.excel-london.co.uk). The 2016 Congress will be the first ever held in the United Kingdom, a country that has contributed much to research and treatment in MS. Many excellent UK-based scientists and clinicians have focused their career on MS, none more so than Professor Ian McDonald, who was active during the latter decades of the twentieth century and whose name is given to the McDonald diagnostic criteria. It is indeed appropriate that the United Kingdom will host an ECTRIMS Congress. The meeting will also partner with the Annual Conference of Rehabilitation in MS (RIMS). The Congress will offer comprehensive and exciting scientific and teaching programmes. An exciting scientific programme has been developed by the Local Organising and Scientific Programme Committees. There will be plenary, platform, young investigator, hot topic (some in a debate format) and poster sessions. Themes will include disease mechanisms, prognostic markers, developments in imaging, and approaches to early treatment, long term treatment effects, the latest clinical trial results, and emerging targets for modulation of the innate immune system, neuroprotection and repair. While MS is the main focus, there will be talks on other inflammatory demyelinating CNS diseases. There will be a special section of the programme for MS nurses and symposia sponsored by the European Charcot Foundation and industry. The preliminary programme will be available in spring 2016. The registration will be open at around the same time. Please visit the ECTRIMS 2016 website for continuously updated information. Abstract submission will start January 2016. The registration to the ECTRIMS 2016 will be available in February 2016. ECTRIMS offers a comprehensive range of fellowship programmes for different target groups. The ECTRIMS Fellowship Programme competitions for 2016 are underway. The deadline for application for both the ECTRIMS Postdoctoral Research Fellowship Exchange Programme and ECTRIMS Multiple Sclerosis Clinical Training Fellowship Programme closed on December 1st 2015 and selection of successful candidates will be made the first half of 2016. This fellowship is offered to qualified/licensed nurses to provide the opportunity for them to obtain additional expertise through practical nursing experience and training in a mentored MS environment in Europe. The aim of the programme is to enhance care and support of individuals with MS by fostering improved clinical care and education and by helping to promote best practices in nursing care throughout Europe. ECTRIMS will support up to three fellowships each year, each with duration of 6 months to 1 year, with a stipend of up to €50,000. Training must be under the direction and mentorship of a senior MS nurse, in association with a senior MS clinician where appropriate, at a European clinical site with significant expertise in MS.
ECTRIMS and the European MAGNIMS (Magnetic Resonance in MS) network jointly support a postdoctoral fellowship to foster the development of young researchers in magnetic resonance studies in MS. The goal of this programme is to achieve transfer and broadening of knowledge regarding the application of magnetic resonance to MS research and to promote the researcher’s integration into the international scientific community. ECTRIMS will support two fellowships annually, each with duration of 1 year, with an annual stipend of up to €50,000. 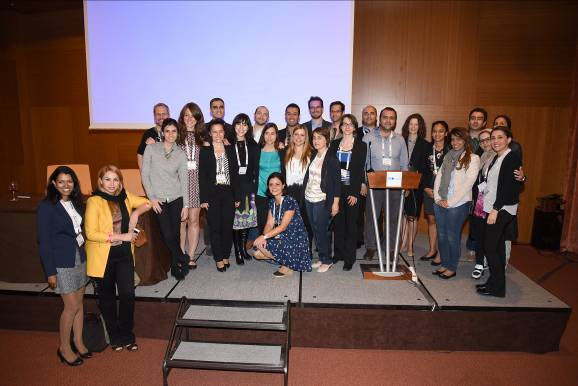 During this years’ ECTRIMS annual congress the 1st Joint ECTRIMS/MSIF Fellowship Alumni Meeting took place on Friday 9 October 2015. The event started with a welcome address by the President of ECTRIMS, Prof. Xavier Montalban and Peer Baneke, CEO of MSIF, followed by 8 short talks from current and past fellows of ECTRIMS and MSIF, presenting their research projects, training activities and reporting on their fellowship experience. The talks were moderated by Prof. Xavier Montalban for ECTRIMS fellows and by Dr. Dhia Chandraratna, MSIF Head of Research, for MSIF fellows. ECTRIMS has decided to establish a regular annual meeting with its fellowship awardees, Executive Committee and Council members, including presentations and a reception. The aim is to offer an attractive platform for promoting research training and exchange of information as well as to offer research and networking opportunities among its fellowship alumni, the Executive Committee and ECTRIMS Council. Further details and more photos are available in the photo gallery on the ECTRIMS website here. ECTRIMS’ mission is to facilitate communication, create synergies and promote and enhance research and learning among professionals in the field of MS. A good cooperation with other organizations which share similar missions and objectives is very important to ECTRIMS in order to be effective on a worldwide scale. ECTRIMS has already a longstanding relationship with ACTRIMS. It has been formalised by signing a mutual Memorandum of Understanding between the two societies in 2015 regarding the organisation of future joint congresses. ECTRIMS has also signed individual Memorandum of Understanding agreements with the other MS societies in order to align activities and to create synergies. The ECTRIMS Online Library offers the possibility to search for abstracts, webcasts, ePosters and presentations from the ECTRIMS 2015 congress by event, type of content and speaker/author and to view these publications online. To access the ECTRIMS Online Library please register here. Did you know that the ECTRIMS mission and vision supports initiatives that benefit the MS community? To this end, ECTRIMS may endorse position statements, policies, meetings and other initiatives promoted by other organisations that complement and support ECTRIMS goals. For more information about the ECTRIMS endorsement policy and procedures, click here. ECTRIMS supported in 2015 the 15th European School of Neuroimmunology Course (ESNI Summer School) which took place from 1-4 June 2015 in Prague, Czech Republic, with 50´000 EUR. This annual course is aimed at young students and researchers in the field of Neuroimmunology but also at seniors and experts who can benefit from learning about new developments in this field. Further information on the course is available at www.esni.isniweb.org.